Nearly two dozen members from the Atlanta and Irish Modern Quilt Guilds participated in a swap. The big reveal on this side of the pond was at the AMQG meeting yesterday morning. It was a fun challenge. Here’s the bundle all wrapped up (before putting in the padded mailer at the post office). I included some extra goodies in the bundle. It’s now on its its way to my swap partner Karen. Package should arrive in 6-10 days, according to the clerk at the post office. And for the AMQG label police (a/k/a Pam Cobb) – here’s the label. See? I added one! 🙂 This looked much better than the original one and takes up a lot less space on the back of the quilt. 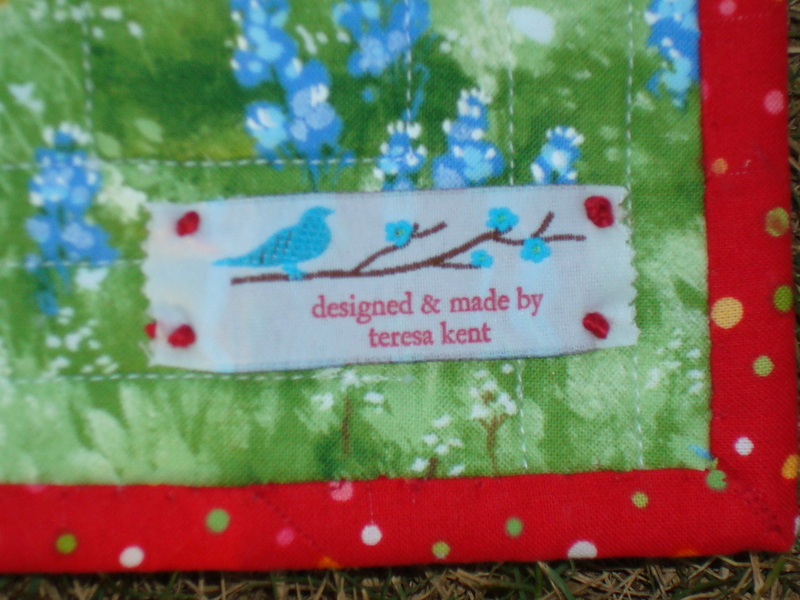 It also doesn’t get in the way of the design on the backing fabric. Happy now?